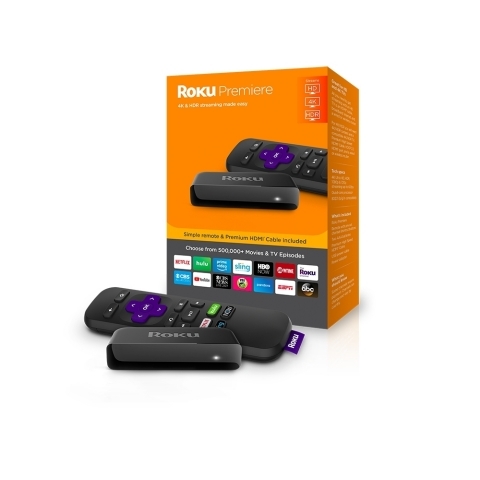 LOS GATOS, Calif.--(BUSINESS WIRE)--Roku, Inc. (Nasdaq: ROKU) today announced it is expanding its streaming player lineup with the addition of two new devices – the new Roku Premiere and the new Roku Premiere+. The Roku Premiere ($39.99 MSRP) and Roku Premiere+ ($49.99 MSRP) are simple to use and offer brilliant picture quality in HD, 4K Ultra HD or 4K HDR. The company also announced updates to its ultimate streaming player, the Roku Ultra which now features premium JBL headphones yet remains at the same price of $99.99 MSRP. With the Roku Premiere and Roku Premiere+, customers can search for favorite shows and discover thousands of free and paid channels to stream almost anything, including hit movies, popular shows, live TV, news, sports and much more. Access to free content is easy to find with The Roku Channel, which offers access to award-winners, cult classics, live news and more with no subscriptions and no fees; and Featured Free provides users with direct links to free in-season episodes of top network shows and full past-season catch-ups. The 4K Spotlight Channel offers easy access to streaming movies, TV shows and more filmed in ultra-crisp, ultra-clear 4K Ultra HD and brilliant rich color. The new Roku Premiere is a simple way to start streaming in HD, 4K Ultra HD or 4K HDR for $39.99 MSRP, while the $49.99 MSRP Roku Premiere+, a Walmart exclusive, includes a voice remote with TV power and volume buttons. At just $99.99 MSRP, Roku’s most powerful and feature-packed player gets – and sounds – even better than before. It offers everything a streamer could want including an enhanced voice remote with TV power and volume buttons and new premium JBL headphones (valued at $39.95 MSRP) for private listening. Additionally, the lost remote finder feature can be set to play new tones including SportsCenter’s DaDaDa from ESPN or HBO’s Game of Thrones theme song beginning in November. The Roku Premiere is available for pre-order at Roku.com beginning today and, along with the Roku Ultra, will be available at all major retailers beginning in early October. The Roku Premiere+ will be available exclusively at Walmart and Walmart.com in early October.